These hand-crafted, floating shadow box shelves are great for holding picture frames, plants, vases, or anything you want to put on display. 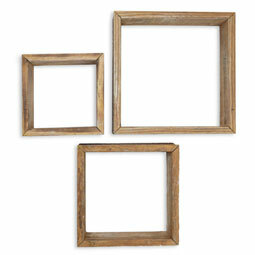 Whether you hang them together in a cute arrangement or use them as stand-alone shelves, these shadow boxes will add rustic charm to any room. A rustic-lover's dream for adding architectural depth and decor to any living space. These hand-crafted floating, shadow box shelves are great for holding picture frames, plants, vases, or anything you want to put on display. Whether you hang them together in a cute arrangement or simply use them as stand-alone shelves, these shadowboxes will add rustic charm to any room. Available in several colors and shapes, you can easily match your existing décor or use them as an eye-catching accent piece. Large Box: 18" x 12", Medium Box: 15" x 10", Small Box: 12" x 8"